Leveraging the proven 5E 4-cylinder platform, the 5090EL Tractor is suited to fit in confined spaces where clearance is a constraint. While this model is of special interest to poultry farmers, it has the power to tackle other jobs with various implements. Special adjustments were made to accommodate low clearance applications. By lowering the rollover protective structure (ROPS) hinge point, operators will be able to reduce the overall tractor height, enabling them to stay below overhead obstacles. Adding to the possibility for low clearance, a factory-installed side exhaust is offered with the 5090EL Tractor. Lastly, updated tire options are available to suit the application. 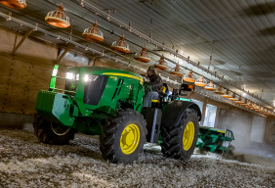 Regardless of tire selection, fenders can be adjusted to accommodate producer preference while optional additional fenders can be added to provide ample coverage to protect operators from mud and debris. This PowrReverser transmission provides 24 forward speeds and 12 reverse (24F/12R) speeds. Included in base equipment is a dual speed 540/540 Economy power take-off (PTO), and it is ideal for applications requiring frequent directional changes, such as loader work and PTO work like rotary cutting and baling hay. See the PTO functional area for more information on E-PTO. The 12F/12R PowrReverser transmission provides ample speeds and ease of operation. This transmission comes standard with a dual speed 540/540 economy power take-off (E-PTO) and is ideal for applications requiring frequent directional changes such as loader work. Hydraulic wet clutches (forward and reverse) maximize durability and outlast the life of any dry clutch. When tractors are run by multiple operators with a variety of experience levels, a wet clutch is the best way to maintain transmission integrity and performance while decreasing clutch replacement costs. Two platform-mounted levers offer easy and comfortable shifting for a pleasant operator experience. The gear-shift lever is easy to reach and the less-used range lever is shorter. Unique knobs make it easy to distinguish between the two. The forward lever selects one of four gears. The operator must depress the clutch while shifting. 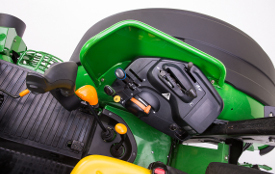 The rear lever selects one of three ranges: A, B, or C.
All tractors have economy PTO (E-PTO), a fuel-saving feature which allows operators to run rear implements at 540 PTO rpm but at lower engine rpm. 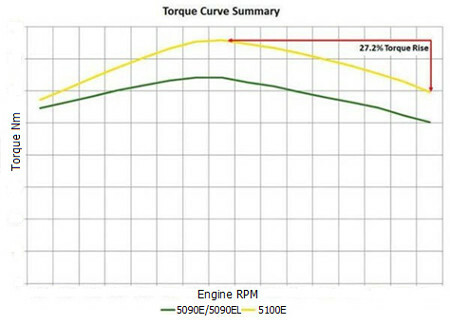 The result is lower engine vibration, reduced noise, less wear and tear on the engine, reduced fuel consumption, and increased operator comfort. 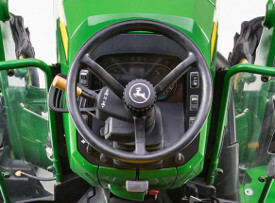 Producer needs drive John Deere to deliver distinctive value in product solutions. The applications in which John Deere utility tractors, implements, and attachments are used are growing by the day. 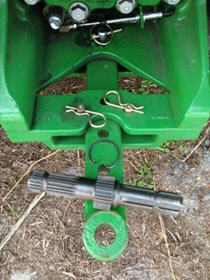 A 540/1000 PTO rpm field-installed kit is available for the 5E Tractors. With this kit installed, operators can switch between standard 540 or 1000 PTO rpm based on the requirements of the implement. From rotary cutting, to shredding to snow throwing and baling, the capability to operate an implement requiring 1000 rear PTO rpm is available.